You’ve probably heard of browser flags: hidden experimental features that you can toggle and try out. For instance, tweaking some of Chrome’s flags Speed Up Chrome By Changing These 8 Flags Speed Up Chrome By Changing These 8 Flags While many people claim Chrome is a memory hog, it is possible to greatly improve your browser's speed by tweaking some "flags". Here are the eight best tweaks that you can make today. Read More can make it even speedier. If you like getting cutting-edge features and don’t mind the potential for experimental glitches, enabling flags is a fun way to check out what developers are working on. 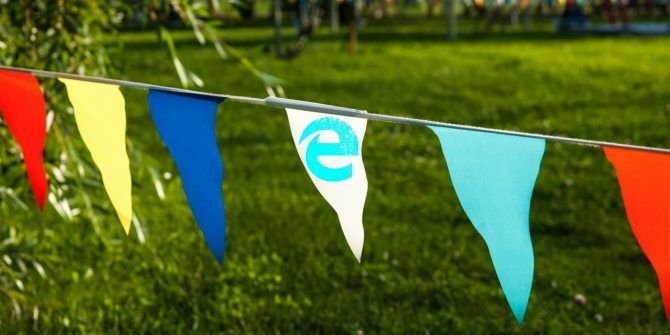 Now it’s possible for you to try out some flags in Microsoft Edge. We’ve already covered all of Edge’s existing settings A Quick and Dirty Guide to Every Setting in Microsoft Edge A Quick and Dirty Guide to Every Setting in Microsoft Edge If you decide to use Edge, the first thing you should do is set the browser up, which includes tweaking all of the settings according to your needs. Here's everything you need to know. Read More , but it’s no secret that Edge doesn’t feature the same amount of customization seen in other browsers. Enabling some of these tweaks could make it more of a contender. Just type about:flags into the address bar in Edge to open the menu. You’ll see a variety of settings — some are already enabled while others aren’t checked by default. Unfortunately, there aren’t too many exciting features here for everyday users. Most of them are developer options, which are useful if you’re testing websites but not for much more. The most valuable option here is Enable TCP Fast Open, which you’ll find under the Networking header. This is a new procedure designed to speed up web page loading by quite a bit. Those using it have reported a solid speed increase, so it’s worth visiting this menu just to try this option. If you like the new push notifications that nearly every website is offering these days, you can Enable push notifications to gain access to those. You can also set Enable touch events to Always off if you don’t want Edge to respond to touchscreen gestures. Overall, Edge’s Flags menu isn’t as exciting as Chrome or Firefox’s. But it still has a couple of settings worth popping it open for. Hopefully in the near future, as Edge grows This Is What Microsoft Edge Is Good For This Is What Microsoft Edge Is Good For Microsoft Edge is way better than Internet Explorer. It's time to become browser agnostic. We'll show you the unique features that make Edge worth using, even if it's not your main browser. Read More , we’ll see more power user options hidden here. Did you try enabling the TCP Fast Open option? Did you know about this hidden Edge menu? Tell us if you ever use Edge down in the comments! Explore more about: Microsoft Edge, Windows Tricks. when the about:flags is open press ctrl+shift+D and the rest of the menu will appear.